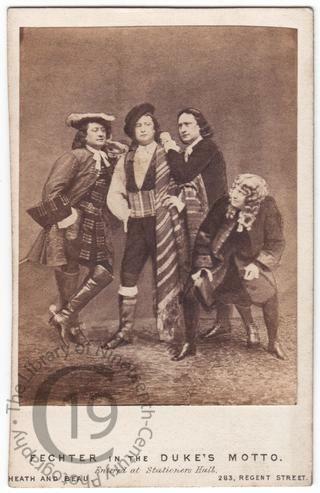 A composite carte-de-visite portrait showing the Anglo-French actor Charles Fechter as he appeared in four different scenes in the phenomenally successful melodrama The Duke’s Motto. An adaptation by John Brougham of Paul Féval’s Le Bossu [The Hunchback], the play was first presented at the Royal Lyceum Theatre on Saturday 10 January 1863. According to the review that appeared in the Times the following Monday (12 January 1863), the plot was ‘not a little intricate’. A detailed synopsis, supplied by the author, took up nearly an entire column of the newspaper. Set in France during the early eighteenth century, the tale involved a murdered duke, the rescue of his infant daughter by ‘a wild daredevil’, played of course by Fechter, a villainous prince’s scheme to secure the child’s inheritance, his hunchbacked henchman, gypsies on the Spanish border, and an Irish soldier of fortune. Towards the end of the play, the evil hunchback is killed by the hero, who takes his place in disguise. This all culminates with the exposure of the prince as the murderer, the restitution of her fortune to the now-adult daughter, and the discovery that she and her rescuer love one another. ‘This plot, in which all the romance, adventure, and criminal daring that seem to belong to a ruder age […] is brought into a drama which for its power of sustaining an interest for three hours and a half by dint of construction and situation alone could scarcely be matched. […] There is not an act that is not remarkable for some brilliant scenic effect’. The reviewer singled out Fechter’s performance for special praise: ‘In giving vitality to this complicated piece the genius of Mr Fechter is invaluable […] nothing can be more full of life, intelligence and variety than his Lagardère. Careless and light-hearted at the beginning, earnest and devoted when he has undertaken his serious mission, keen in his expression of vindictiveness, passionate and tender in his love – he is the very man to make himself the leading figure in such a story, and to extend to the adventurer the interest inspired by the adventures’. Photographed by Vernon Heath and Adolphe Beau of London.